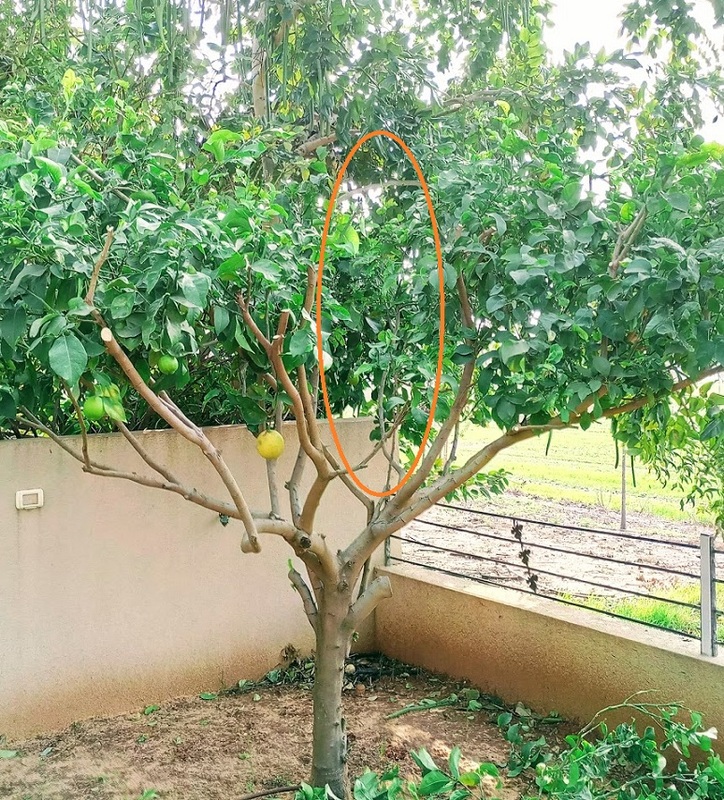 How to prune citrus trees? 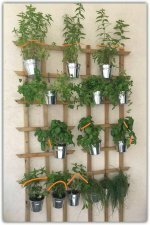 Hight control - low hanging fruits and easy to pick and lower trees are easier to care for. Sanitation - removing twigs and dead stems will encourage healthy new growth. Oh yeah... and citruses look awesome! 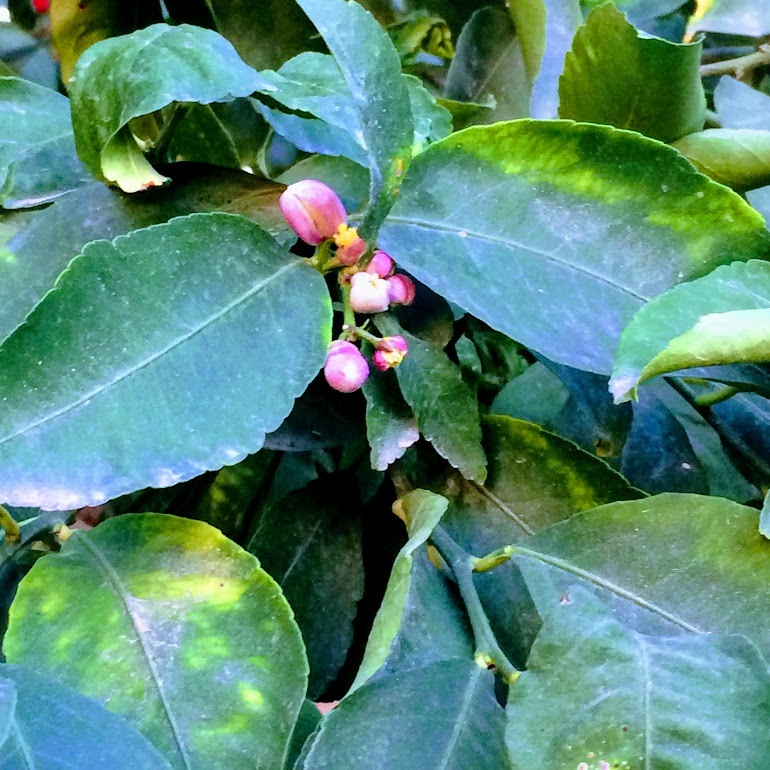 There are 5 different types of hand pruning methods for pruning citrus trees, and all can be implemented almost, all year round. First to be pruned are the "Shoots" and "Suckers", these guys can and should be removed whenever you see them. Just take them off, prune as close as you can to the trunk and get ‘em out of the way. Second to be pruned are the small dried-out thorny twigs. 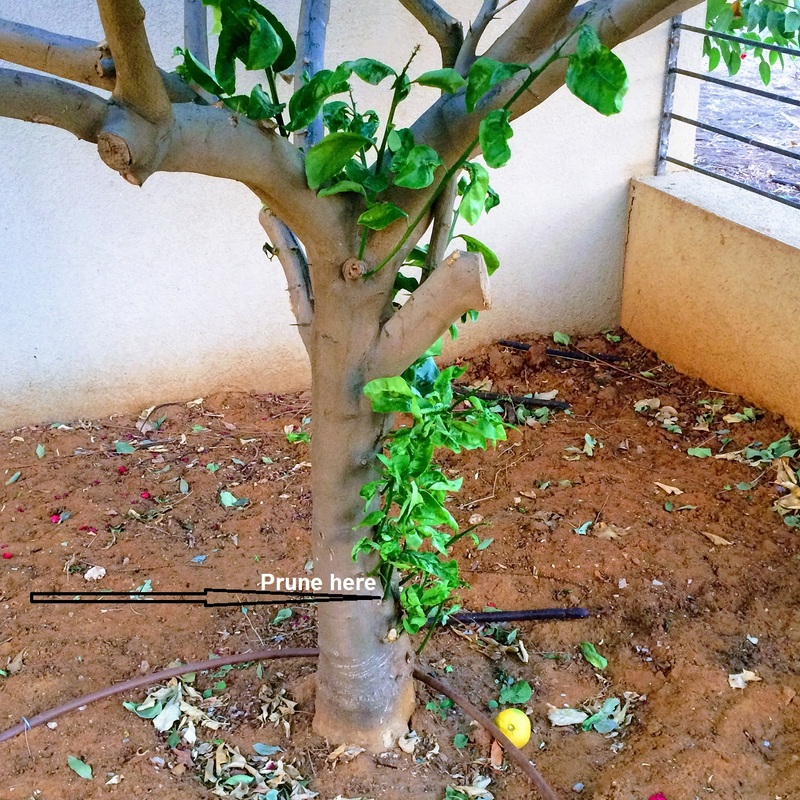 Removing them systematically as part of your routine pruning treatment will prevent potential diseases. It also takes care of aesthetics, because your tree will just look better without them. 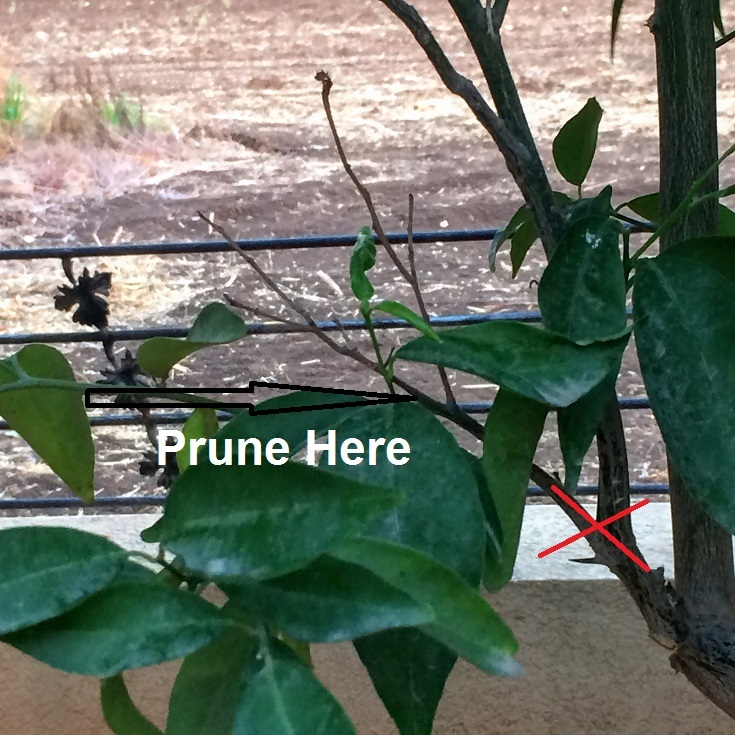 Prune as close as you can to the nearest green branch and prune just above the split. You can cut at the split point, but for the health of your tree, I would prefer you to avoid it. Remove only the "brown" colored twigs. Third to be pruned are the slightly larger branches, not to big though. Don't go looking for your chain saw just yet! We’re still in the world of hand pruning. It is true that citruses can and will produce fruits in the shade, but a little sunlight is good for everyone. So, open small "windows" that will allow more light to enter and the air to circulate. It will do good and is healthy for the main trunk, and for the rest of the tree. Fourth - If the “dress” of your citrus tree reaches the ground, and you like that long swaying look, I recommend that you prune the edge just enough to keep it at least 10 inches from the ground. Leaves that touches the ground can potentially cause diseases. 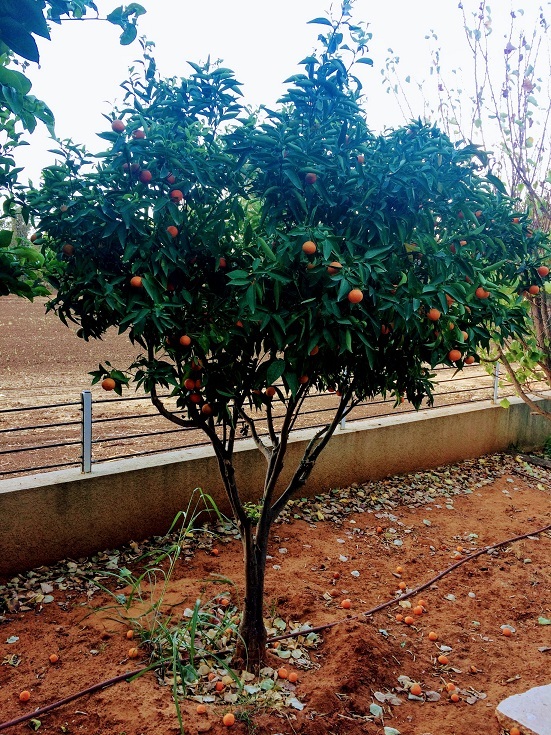 Remember your main goal when pruning citrus trees, and keep it simple, so that it will be simple to keep. The Hidden Fifth - If last season you ended up with dozens of rotten fruit all over the ground, this year I suggest you consider "dilution". That means you remove some of the fruits that are yet to come. All you have to do is decide which one of these beautiful blossoming white flowers you want to prune - and just cut. 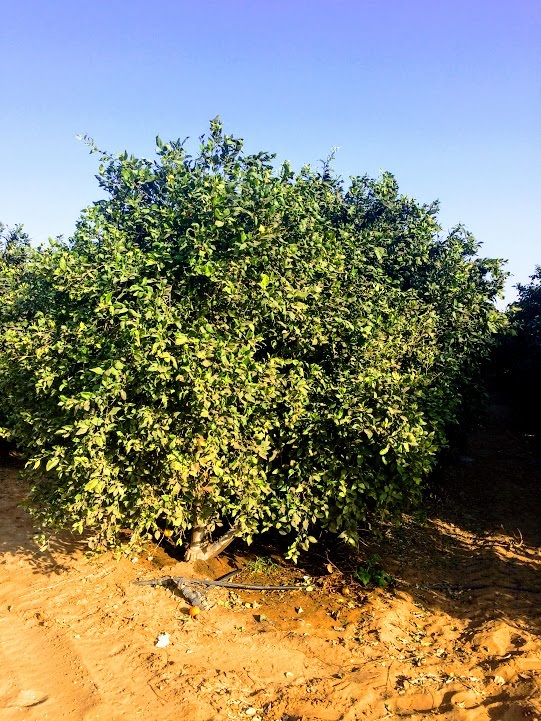 when pruning citrus trees reducing the number of future fruit is not a bad thing, there are times when a single tree produces fruits like an orchard. It’s ok to help it out a little. When? Whenever you see them. BTW, regard the tree’s height. Personally I prefer to have the canopy sit up high, rather than the low hanging ‘dress’ we saw above. I think it’s easier to maintain, easier for fruit picking, and I personally think it’s more aesthetic – but we won’t argue about that. What I wanted to get across, bottom line, is that pruning your citrus trees, as part of your routine is easy and rewarding. Weeds - don't forget to remove the weeds that gather around the trunk. It’ not officially pruning, but it effects the health of the tree, and looks cleaner. As you can see, I remind you because I usually forget to do it myself. Remember - pruning citrus trees in terms of routine care and training the tree to your needs is very easy.​ Maintain the height, the canopy, clean the tree from the inside, open a small window once a year and enjoy your fruit – literally!